Warm, spiced and comforting, everything we want in a winter drink! This Winter Warmer Mulled Sangria recipe is a pure delight and perfect for any cold weather party you may be planning. First of all, it should be noted that you will need to plan ahead when making this mulled sangria. The first step requires 3-7 days for the booze and fruit to marry and it is worth the wait! What I found most interesting is the use of fresh fruit and a spiced liqueur to add a seasonal flair to the average Sangria recipe. 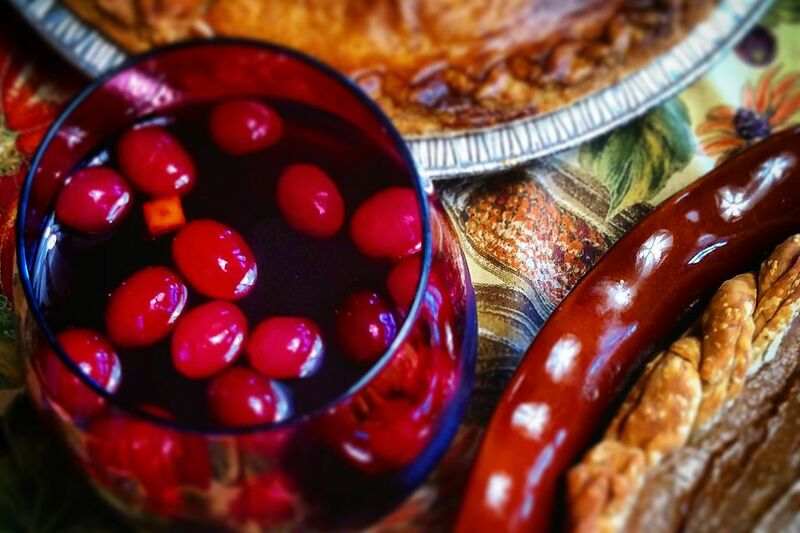 The red wine base is there, but it also includes Jagermeister Spice with PAMA and fresh cranberries and pomegranate. It is a punch you can only pull off in fall and winter because of the seasonality of those fruits. Enjoy this punch at your holiday parties or any occasion when friends are gathering and you need a toasty warm up. It can be served cold as well, but I recommend it hot. It is fabulous, flavorful and a sangria that will impress anyone. Mix the wine and liqueurs in a pitcher. Add the fruit, cover and let sit for 3-7 days. Boil cranberry juice and club soda in a small saucepan. Add a sachet of mulling spices and allow to sit hot for 15-30 minutes. If that isn't enough spiciness for you, you can also add a sachet to the finished pitcher for extra flavor. Pour cooled, mulled juice mix into the original pitcher and stir to combine. Serve warmed or room temperature, being sure to include some of the boozy fruit! The Red Wine. As with any sangria, the choice of wine is not going to make a big difference in the final drink. There is a lot going on here, so you are simply looking for a good background to build flavors on. Karl recommends 'something dry and spicy, like a Chianti or a dark red blend -- I used Franklin Hill Vineyard's Trio.' I followed her Chianti suggestion and it was perfect. Jagermeister Spice Liqueur. Jagermeister Spice is the brand's first expansion beyond their famous herbal liqueur. Fans of pumpkin and seasonal spice liqueurs will really enjoy this one. On the other hand, Jager lovers may not enjoy it as much as the original. This offering is lighter in both flavor and alcohol content than its big brother. It tones down those signature Jager spices and adds favorite winter baking spices, including cinnamon and vanilla. Jagermeister Spice is a limited release that was first launched in October 2013. As of 2016, it remains an annual offering available through the winter months. Look for it on shelves in October and November. What are mulling spices? Essentially it is a combination of spices that we typically associate with the winter months. It often includes allspice, anise, cinnamon, cloves, nutmeg, vanilla and orange peel. Other ingredients like apples, ginger, figs and raisins can also be included. There is no right or wrong way to put together a sachet of mulling spices and you should feel free to use any of those ingredients that you like. I consider cinnamon, clove, nutmeg and orange essential to my mulled recipes and will add others depending on the drink. Creating a Spice Sachet. There are many ways to create the sachet itself. I prefer to contain everything as much as possible because it is easier to retrieve from the liquid. Cinnamon sticks are easy to remove, so I simply let them float. Place the mulling spices in a small piece of cheesecloth or empty loose leaf tea bag. Tie a knot in the cloth. For easy retrieval, place a small sachet in a tea ball or a similar infuser with a chain. Alternatively, tie a piece of (clean) string around a larger pouch. Hang the chain or string over the side of the container so you can easily grab it to remove the spice pouch. When in doubt, use a ladle to remove the sachet. How Strong Is the Winter Warmer Mulled Sangria? Fresh fruits make it a little more difficult to estimate the strength of a drink, but we can get a rough idea of how strong this sangria is. The liqueurs are lower proof, so they do not add much alcohol to the drink either. It's pretty easy to say that this recipe has an alcohol content of about 9 percent ABV (18 proof). This is just slightly lower than the average Chianti is on its own.